Redwood Toxicology Laboratory (RTL) is the government services division of Alere Toxicology and one of the nation's largest drug and alcohol testing laboratories. RTL is committed to providing reliable, innovative and value-focused substance abuse screening products and lab services to the government, criminal justice and treatment marketplaces. We have the experience and resources necessary to keep pace with new trends in abuse. We provide confidence in testing. We offer you comprehensive, cost effective drug and alcohol testing options. Our laboratory services include urine drug testing, oral fluid drug testing, prescription drug testing, EtG/EtS alcohol testing, "synthetic marijuana" drug testing, "bath salt" testing, steroid testing, and more. Offering a wide range of online reporting and tracking solutions to fit your business. Our rapid on-site screening devices, in combination with lab services, provides our clients with a comprehensive and convenient drug testing solution. Customer confidence in our products and services is our goal. 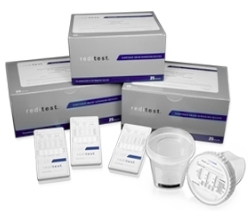 Take the first step in detection with Reditest. Now you'll know. Collections and reporting have never been so easy. Quickly complete lab test request forms and improve your drug testing process. Statement on Forensic Use Products.